Organic Rosehip Oil is the gift mother nature made for our skin. This hardworking oil solves a range of skin challenges; it’s antibacterial, moisturising, anti-inflammatory and is full of antioxidants and vitamins. Even better, it’s perfect for all skin types and although it’s an oil, it skips the greasy feeling, soaking beautifully into the skin. Rosehip Oil is extracted from the seeds of a wild rose bush; Rosa rubiginosa, using a cold-pressed method to separate the oil from the seeds and hips. Popular with the ancient Mayans and Native Americans, Rosehip Oil was used centuries ago for its remarkable regenerating properties. Modern day beauties can still make the most of this skin saving oil, here are 4 reasons to embrace Rosehip Oil. Rosehip Oil is an anti-ageing powerhouse thanks to high amounts of vitamin A and C, potent weapons to fight sagging skin. These vitamins fuel cell production and growth, reducing the look of wrinkles by stimulating fibroblasts.Fibroblasts are responsible for creating the tissue in the deep layers of your skin, keeping it firm and healthy looking. Free-radicals damage plays a big role in accelerating wrinkles,Rosehip Oil contains beta-carotene to combat free-radical damage, slowing down the signs of ageing. Rosehip Oil is famous for its rejuvenating properties. Extensive studies have shown the oil has a positive, in some cases dramatic, effect on reducing scars and stretch marks. 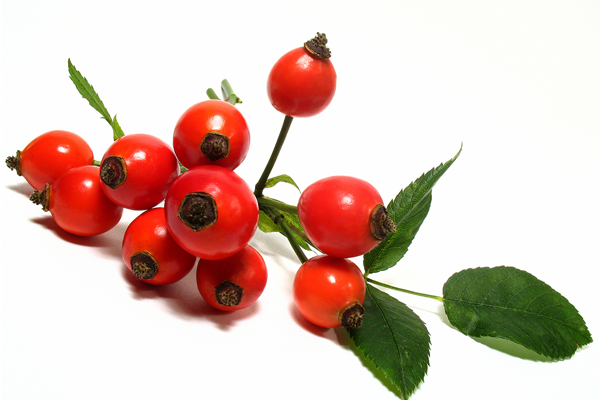 Rosehip Oil is full of fatty acids Omega 3, 6 and 9 which are emollients, helpful for skin repair and regeneration. The oil helps increase the elasticity of the skin, allowing rigid scars to ‘relax’ and blend into the surrounding skin and assists evening out skin tone, making the scar appear less obvious. Great for stretch marks too. Rosehip Oil is a powerhouse of hydration, thanks again to those essential fatty acids; Omega 3, 6 and 9. Vitamin A in the oil has tiny molecules, allowing it to penetrate deeply and quickly into the skin, making it a superb moisturiser. It’s especially helpful to nourish and rehydrate dry elbows and knees, you can even pop it directly onto cracked lips. Rosehip Oil does wonders to lighten sunspots and freckles. The combination of fatty acids and vitamin repairs age spots and discolouration, evening out the blotchy skin tone; a tell tale sign we’ve spent too much time in the sun. The vitamin E contained in Rosehip Oil has natural anti-inflammatory properties that soothe sensitive skin. Rosehip Oil is clearly a winner as a natural remedy for a range of beauty problems. I’ve harnessed the power of this ancient oil in my Nushka Skincare, including Rosehip Oil in my Nushka Serum and my Nushka Moisturiser. Rosehip Oil is the active ingredient in my Nushka Serum; my go to recommendation for the treatment of scars and stretchmarks. It works wonders with the serum’s other key ingredient, a herb called gotu kola, also known as Centella asiatica. Gotu kola is effective in speeding up the wound healing process as it stimulates blood flow to the cells and protects against infection. Nushka Moisturiser is a revitalising blend of aloe vera and organic shea butter to refresh tired skin while working with the Vitamin C of the Rosehip Oil to promote collagen synthesis. A real skin saving team of natural ingredients.